Was your IVF failure because of bad luck ? or because of a bad clinic ? We all know that IVF does not have a 100% success rate, but when an IVF cycle fails, you are never sure what the reason for the failure was. Was it because of plain bad luck ? After all, why good looking embryos do not implant is still one of those things we do not understand - it is one of medicine's unsolved mysteries ! We know that human reproduction is not very efficient, and even fertile couples take time to make a baby in their bedroom, which means sometimes all patients need to do is be patient and try again. Or was it because the IVF clinic was not good enough ? How is the poor patient meant to decide what to do next ? Should she stick with the same doctor ? Or should she change clinics ? This is the million dollar question, and the answer depends upon doing a careful analysis of your failed IVF cycle - preferably by an independent IVF expert, who can tell you if the quality of care you received was upto the mark. The good news is that there are only two simple questions you need to answer to make a well-informed decision ! 1. Did the doctor do a blastocyst ( Day 5) transfer ? 2. Did he give you photos of your embryos before transferring them ? If the answer is No, then this is red flag, and you should strongly consider changing your clinic ! Please find a better clinic if you want to maximise your chances of success - one which does only blastocyst transfers and provides embryo photos routinely to all patients ! A patient just sent me this email. We had our 1st cycle in July this year with ICSI as I had just turned 45 years and my partner is same age, we had a very good grade 1 embryo put back but didn't implant. So we have just now had another cycle on the 24th November this month, I had a mature egg follicle size was 19 mm sperm was good they done ICSI again but this time they said it didn't fertilize ? They told us the egg was good and the sperm was good but it just didn't happen. How can I have a good egg and sperm but didn't fertilize using ICSI . I could understand it if the egg wasn't a good one or sperm, and how come we had a grade one embryo few months ago and now nothing? Does this sound right to you ? ICSI with a good egg good sperm but no fertilization I cant get my head around I've been so upset. This was my answer to her. This is why a woman's fertility drops as she gets older ! The limitation with IVF technology today is that we cannot test the mitochondrial competence of the egg . What can you do when your IVF doctor does not agree with you ? Infertility presents a number of unusual challenges . It is caused by a medical problem - for example, blocked fallopian tubes, or a low sperm count - and this means we can offer medical treatment for it, but the truth is that childlessness is a social label. This is why treatment for infertility is elective - and patients have to decide for themselves if they want to do IVF or not. Is it safe for me to postpone having children for the next 4 years ? I just received this email from a young 31 year old woman.
" I have an exciting job in a bank, and want to pursue by career. I am married, but want to postpone having a child for the next 3-4 years, as I am on a the fast track to cracking the glass ceiling. However, my mother is insisting that I put my career on hold, and have a baby now. She is worried that I will find it hard to conceive if I put this off any further - and that I won't be able to enjoy my baby if I get older. What are my options ?" This has become an increasingly common dilemma for young professional women today. Like their male colleagues , they too want to have a baby and pursue their career , but are unsure about how deferring child-bearing will affect their fertility - especially if they want to have more than 2 babies. How can they have their cake and eat it too ? It can be very hard to set priorities, and women are often torn between growing their families , or growing their career. There are no easy answers, and each woman needs to find her own solution. It's a good idea to check your ovarian reserve, so you have some idea about how much time you have left before your ovaries let you down. The easiest test is a simple blood test which checks your AMH level , and you can read more about this at http://www.drmalpani.com/knowledge-center/infertility-testing/amh. While a single level will not provide a fool-proof answer, measuring your ovarian age by checking your AMH level is much more useful than just going by your calendar age ! Equally importantly, you can test this on an annual basis, so you can track your ovarian reserve over time. Also, testing your antral follicle count by doing a vaginal ultrasound scan ( read more about this at http://www.drmalpani.com/knowledge-center/articles/afc) provides valuable information about how much time you have left to safely postpone childbearing. Yes, you can do IVF if you get older, but IVF does not turn back the biological clock, and if you have poor quality eggs, then the pregnancy rate with IVF is poor, and you maybe forced to use donor eggs to have a baby. You may then bitterly regret your decision of postponing having a baby ! One option which is worth exploring is social egg freezing, so you can store your young eggs in an egg bank, and use these when you are ready to start your family - one way of having your cake, and eating it too ! Most of us trust our doctors, and are grateful to them when they help us to get better. However, we rarely get a chance to express our thanks. Please share your story about your favourite doctor at www.mydoctormyhero.com ! 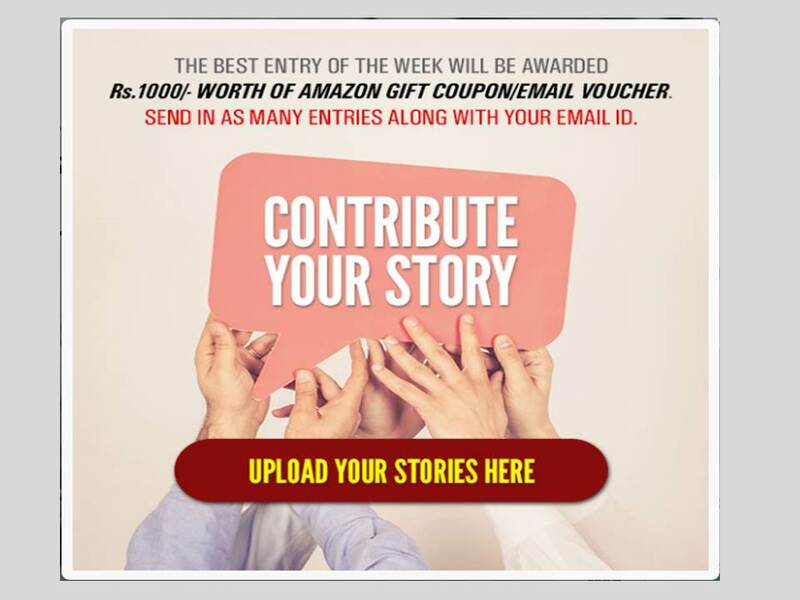 We are offering a prize of Rs 1000 for the best story of the week ! Why you should transfer only a single blastocyst ! Today, our standard practice is to freeze all your embryos at a blastocyst ( Day 5) stage, and then transfer them after thawing them in the next cycle, one at a time. Here's why we think this is the best method for optimizing your chances of having a healthy baby. Let's start off with why we don't advise doing fresh transfers. The chances of getting pregnant depend on two variables - 1. the quality of the embryo, and 2. endometrial receptivity. In a natural cycle, endometrial receptivity and the embryo are synchronized perfectly, which is why fertile women get pregnant in the bedroom so easily. However, in a fresh IVF cycle, because we're super-ovulating you, our focus is on getting you to grow lots of good quality eggs. However, this often means that the price we pay for this is that your endometrial receptivity gets impaired. The truth is that it's hard to have your cake and eat it too, which means we need to compromise when doing an IVF cycle. This is why, even though we get great quality embryos, they may not implant. Now this is true even though the endometrium looks fine on an ultrasound scan , and this is because its receptivity at the molecular level has taken a beating , because of the high levels of hormones to which the endometrium has been exposed to during the fresh cycle. This is why we think freezing all the embryos, and then transferring them later on, is a better option. This allows us to focus on one thing at a time. In the first fresh cycle, we focus on your super-ovulation protocol, to get lots of eggs and good quality embryos. Then, in the second thaw cycle, we can focus on your endometrial receptivity , because we already have good quality frozen embryos , and we just need to transfer them. Thanks to our embryologist's extensive experience and expertise with vitrification, our success rates with freezing and thawing embryos is practically 100%, which means no harm is done to your precious embryos as a result of the freezing and thawing. Why do we prefer transferring a single blastocyst , as compared to transferring two embryos ? I think we all should agree that transferring more than two is irresponsible , because it just increases the risk of a high order multiple pregnancy. 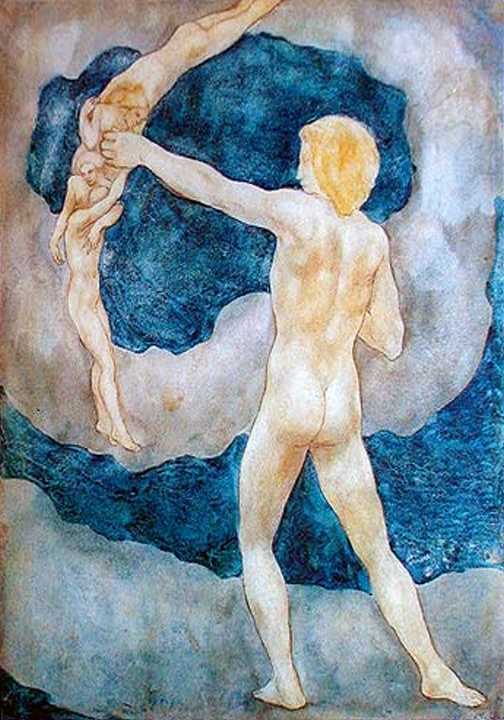 This is dangerous for the babies, because of the risk of prematurity ; and doing procedures like selective fetal reduction to salvage the situation often means that you may end up miscarrying and losing all your babies - something for which you will never forgive yourself ! If I had to pick between one and two, I would still advise one. Now, this, again, is not intuitive because lots of patients say, " A twin pregnancy is fine - it's actually a bonus, because I get an instant family ! What's wrong with putting two back?" Let's look at this logically. Each embryo has its own independent chance of getting pregnant. Let's assume that if we put one top quality blastocyst back in an optimally receptive endometrium, it has a 30% chance of becoming baby. Now if we put two embryos back at the same time, each of them has that 30% chance, and the limiting factor is endometrial receptivity. If the endometrium is optimal, then there is high possibility that both may implant, which is why the twin pregnancy rate is high after IVF. Now the reason why only one implants ( and the other doesn't, even though the uterine lining is receptive) is because one of the blastocysts has some kind of genetic problem, which prevents it from implanting. It's impossible to identify this in the lab, and this is why transferring two blastocysts has a better pregnancy rate than transferring just one - you are improving the chances of transferring a genetically normal embryo by putting back two instead of one. On the other hand, it's possible that when we transfer two genetically normal blastocysts, neither of them will implant because there's a problem with endometrial receptivity. This means no matter how many blastocysts we transfer, none of them would implant. If we put two at a time, we have wasted both these precious embryos. On the other hand , if we put one at a time, each embryo has its own chance of becoming a baby, because the endometrial receptivity may be better in one cycle as compared to another. This way, we are maximizing the probability of achieving a pregnancy for these women , because we are making the best possible use of these blastocysts. I agree this sounds very hit and miss, but sadly these are the current limitations of IVF technology today, and ERA and PGS do not help in overcoming these. The truth is that each blastocyst is worth its weight in gold , and should be given the best possible chance of becoming a baby. The best way of doing this is by transferring one single blastocyst at a time in an optimally prepared endometrium. Yes, this does have disadvantages , because it does mean that the patient needs to come back again for the next cycle, in case the first one fails. However, the good thing about transferring frozen embryos after thawing them is that this is a simple procedure , which is not expensive. The patient doesn't need to take any injections and it can be done in a natural cycle as well. Because we can focus on optimizing both the embryo as well as the endometrium , because we're doing these independently, the overall chance of achieving a pregnancy is much better. I think this is what patients need to focus on - the cumulative conception rate, so that their chances of taking a healthy baby home is maximized. Is your doctor suggesting you transfer many embryos ? This suggests he has no confidence in his IVF lab, and you should look for another IVF clinic ! 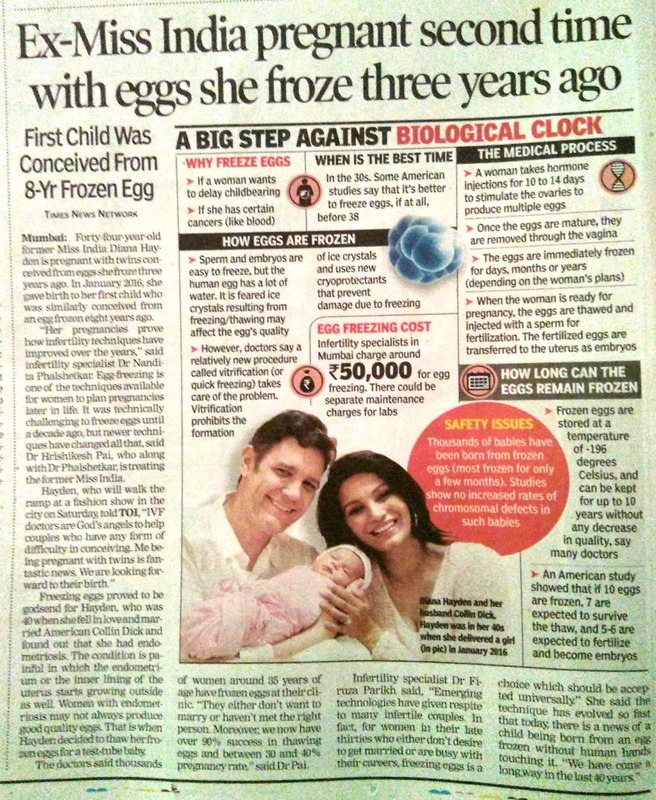 While the Times of India article about a celebrity carrying a twin pregnancy after egg freezing will help increase awareness about the option of social egg freezing as a method for preserving fertility in older women, I am very concerned about the misleading message this is going to send to most women! They are going to start believing that IVF specialists are magicians who can get anyone pregnant - and that a woman's biological age does not affect her fertility. Women will delude themselves that they can happily postpone having a baby for as long as they like , but this is false ! There is a price you pay when you try to have your cake and eat it as well, and the bitter truth is going to create a lot of unhappiness when they find out the truth. When have a biological clock, and while egg freezing is a sensible option for women in their 30s, to try to offer it to women in their 40s is foolhardy. This particular story itself is a little hard to swallow. The success rate of freezing eggs at the age of 41 is exceptionally low - and then to get pregnant with twins with these frozen eggs requires one to suspend their credulity. Human reproduction is not efficient, and there is a lot of wastage and attrition even during IVF. Yes, we can make a 40 year old grow follicles, but many of these will not contain eggs; many of these eggs will not fertilise; and very few will form good quality blastocysts which are worth transferring. Yes, we can get older women pregnant easily, but they have to be willing to use donor eggs , and this is not an easy decision. Of course, clever older women who use donor eggs to get pregnant can now claim that they got pregnant with their own eggs which they had frozen when they were younger - and no one's going to challenge them ! The facts are that the ovarian reserve for a woman drops off dramatically after the age of 38, and the pregnancy rate with IVF even with fresh eggs after the age of 40 is less than 5% per cycle. The live birth rate is even lower, because embryos from older eggs have a much higher rate of genetic anomalies ! The right age to freeze eggs is less than 35, because it gives women a good chance of having a baby. Most IVF clinics will agree that doing this after the age of 40 is futile. On second thoughts, maybe I shouldn't complain about this misleading article , because all IVF clinics will now get lots more referrals from older women who want us to freeze their eggs, but giving patients false hope is hardly the right way to practise medicine ! Many doctors routinely do a laparoscopy and hysteroscopy for all infertile women. They justify this by saying it's a simple diagnostic procedure, which will allow them to confirm that there is no anatomical problem. They also say it's "minor surgery", which just involves a "small cut" and a few hours stay in a hospital. What they don't tell the patient that there's absolutely no need to do a laparoscopy at all ! Let's not forget that the safest surgery is the one you don't need to do ! The truth is that laparoscopy does not provide us with any useful information which we cannot obtain with simpler non-invasive tests, such as a HSG and a vaginal ultrasound scan. Even more importantly, it really does not change the treatment options for the infertile couple. The biggest danger is that it can actually reduce your fertility. Once the doctor puts a telescope inside your belly, he often gets "itchy fingers", and will do a procedure which is not called for at all ! If you doctor tells you to get a laparoscopy, just say No ! After an IVF cycle fails, the first question patients ask is - What do we do differently the next time ? The answer to this question depends upon analysing the failed cycle systematically. After all, in order to move forwards, we first need to look backwards, so we can plan the next IVF cycle more intelligently. Most patients naively assume that all IVF doctors are equally good, but this is completely false. There is a world of a difference between a good doctor and a bad doctor, and this affects your chances of getting pregnant enormously ! Please don't get misled by advertisements - you need to do your own research to make a well-informed decision. The good news is that it's easy to assess the quality of an IVF doctor the first time you meet him, provided you have done your homework properly. Is the doctor well-organised ? systematic ? Does he have a well-defined process ? Is he happy to answer your questions ? Does he spend time talking to you, or are you forced to deal with assistants ? Selecting the right IVF doctor is a critically important decision, so please listen to your gut when making this choice ! What are my chances of getting pregnant with IVF ? This is one of the commonest questions patients ask, but it's actually not a very helpful question for many reasons. 1. While clinics can share their success rate. remember that this percentage figure applies to a group of patients they have treated in the past, and this is not something you really care about. What you really want to know is what your chances of getting pregnant are - and it's impossible for anyone to predict this for an individual patient ! 2. For an individual patient, the percentage figure is meaningless, because the outcome for you is binary - you either get a baby or you don't, which means the final answer is either 100% or 0 % ! 3. For many Indian clinics, the figures they quote are not reliable, so take these with a large pinch of salt ! In any case, a far better way to think about this is in terms of delta , or difference. The key question should be - How much will doing IVF improve your chances of having a baby, as compared to doing nothing ? Thus, if you have blocked tubes, you know that your chances of having a baby without IVF are zero, and you may decide anything is better than zero ! 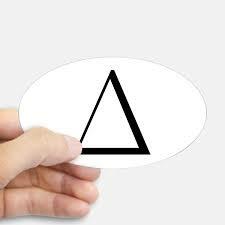 However, this is a very personal decision, and you need to make this for yourself, so you have peace of mind you did your best, and have no regrets later on. Instead of allowing your doctor to subject you to a battery of useless tests which will just send you off on wild goose chase, first make sure you review your medical records, and photos of your embryos. This is invaluable information, which will guide you what to do next ! It's hard to have to accept that you may need to use donor eggs in order to have a baby - after all, we all want to pass on our genes to our children ! You might find this classic poem by Kahlil Gibran useful in guiding your decision !